It may be appropriate to quote here a few words on the pull-off of the .22 " Martini "(with the exception of the B.S.A. " International ") The .22 " Martini " has a single pull and adjusting this is a skilled job. I have seen many devices designed to give adjustment and in nearly all cases they are unsatisfactory. 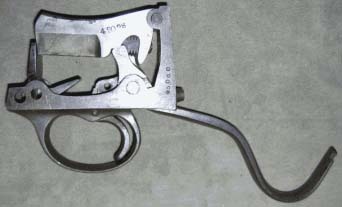 Some rifles have been fitted with trigger stops by drilling the rear of the trigger guard and inserting a screw, the end of which will allow the trigger to be pulled to just the minimum to release the tumbler. In my opinion this is of no advantage whatsoever. It has been claimed by some that the method prevents movement of the rifle by the finger after the tumbler is released. However, if there is movement, it would have started before the release of the tumbler and is a faulty " let-off." 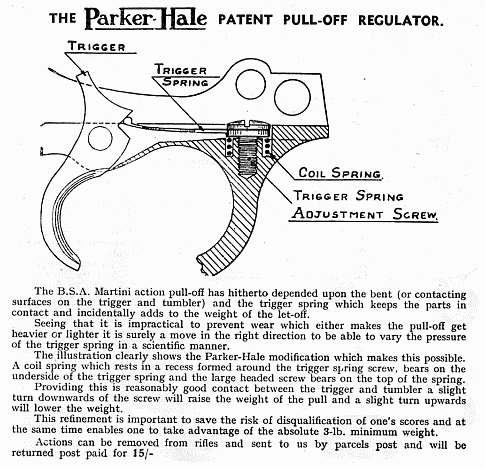 The trigger spring should be flexible and this is not always so. It should not become heavier as it is pulled back. 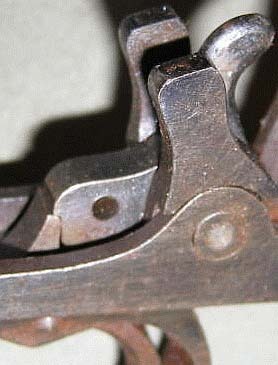 The weight of the trigger spring for a 3¼ 1b. pull-off should be no more than 1½ to 2 Ibs. To get the correct strength reduce the thickness from the underside and make it almost even in its full length and a little thicker near the screwhole, avoiding a sharp corner at this end. 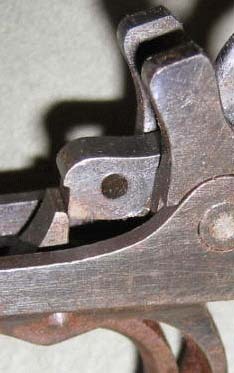 Weigh the spring and when the correct weight is obtained, the pull can be adjusted at the trigger end and tumbler bent. 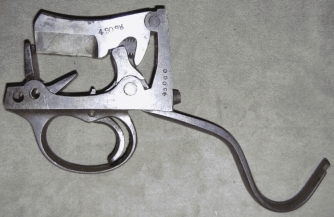 Assuming the tumbler bent is a normal one, as provided by the makers of the rifle, the weight required is obtained by slightly altering the angle of the top edge of the trigger. That is the edge which engages the tumbler bent. The pull-off should be clean and sharp and when the tumbler is released no kick is felt on the finger. If there is still a drag, reduce the depth of the bent in the tumbler. If the tumbler or trigger is soft it will soon wear, and a variation of pull will result. It may be of interest to mention here that if the trigger stop were fitted to a service rifle it would be unfireable. The half-bent is considerably lower than the full bent and would catch the sear every time. With the No. 1 (S..M.L.E.) and No. 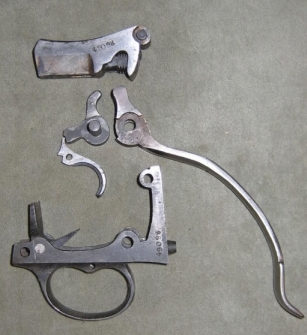 4 Rifles, the sear's position on the cocking piece when the weapon is cocked should be half-way up the face of the cocking piece. When the first pull is taken the sear travels down this face until the second pull is felt; the sear is then close to the bottom edge of the face of the cocking piece. If it is not then low enough down the face, a drag will be felt when taking the second pull, and if the sear comes down too far on taking the first pull, then it will go straight through. 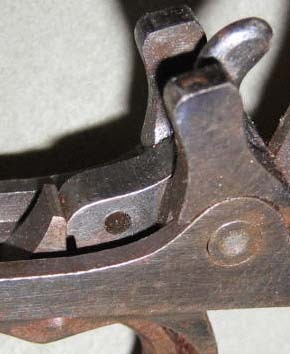 To correct the drag, remove the trigger guard and, with medium emery cloth or very fine cut file, reduce the height of the top stud of the trigger very slightly and repeat until a satisfactory pull is obtained. If the pull is single, straight through, reduce the height of the bottom stud. The face of the cocking piece should be free from dents and have an even surface by using a finishing stone and keeping the strokes vertical to ensure a smooth clean first pull. 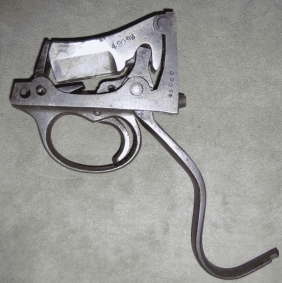 Sometimes a bent trigger guard can cause a single pull. To discover if this is so, take out the magazine and examine the fit of the guard where it runs along the sides of the magazine. The thin ribs should be down on the wood of the fore-end. If there is a gap, however small, take off the guard and give it the necessary bend and replace. The No. 4 often develops a single pull, through this cause, but it is seldom the case with the No. 1.